We Drink Your Milkshake! 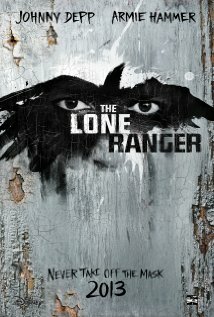 : THE LONE RANGER trailer is full of action, explosions, and slight racism? THE LONE RANGER trailer is full of action, explosions, and slight racism? Johnny Depp has become one of the most hit or miss actors working today. It feels like the PIRATES movies ruined him a little to the point where even his non-blockbuster movies were a little off (see THE RUM DIARIES). So I'm a little skeptical to see him reuniting with director Gore Verbinski with another big Disney movie. What has me interested is the hope that Armie Hammer will have a decent role for once. That guy is charming as hell in interviews and he hasn't been given a chance to shine post-THE SOCIAL NETWORK. So check out the trailer below which comes to us via the folks over at Screen Rant. So I'm not going to lie when I say that a lot of the cool parts of the trailer were totally overshadowed for me thanks to the slightly thanks to Depp's really stereotypical Native American speak. I'm not 100% sure if I'm on board with this, but I'm willing to give the movie a chance when it comes out. That horse looks like he'll be funny, though.